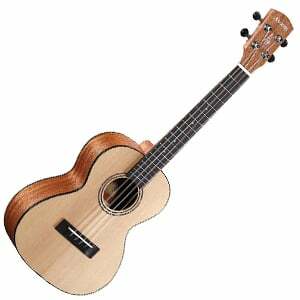 Top 5 Budget Ukuleles – Finding the Perfect Affordable Uke! After reviewing our budget ukulele article, we decided not much had to change. However, we replaced the Caramel CB500 Baritone, which no longer seems to be in production, with a fantastic affordable electric offering – the Vorson FSUK1BK! Unlike an electric, acoustic or classical guitar, buying a budget ukulele with some quality isn’t too difficult – if you know where to look. Ukuleles are slightly cheaper for brands to manufacture, so you end up getting more instrument for your cash. Having said that, the budget category is still flooded with cheap, toy-like, no-name ukuleles that, at best, sound tinny and quiet, and at worst will break within a few weeks! Who Buys a Budget Ukulele? Our chart of the best ukuleles in the wallet-friendly sub-$100 price range are the complete opposite – full of quality, decent woods, and good tone for the price. In the chart below we try to include at least one of each ukulele size category: concert, soprano, tenor and baritone, which will give you a good snapshot of the current market. Then stay tuned for our guide to buying a good budget uke! The price may be tiny, but the quality is astonishing! An affordable electric travel uke offering huge value. Alvarez offer a budget tenor uke with real elegance. A Hawaiian tattoo-inspired budget beauty from Luna Guitars. Ever wanted to shred on a ukulele? This is your chance! Looking for a great uke on a tight budget? It’s hard to go wrong with the very popular KA-15S from Kala, which seems severely underpriced for the quality on offer. The soprano scale body is made entirely of mahogany, with a lovely satin finish that feels comfortable and sleek to hold and play. The neck is also mahogany and sports a rosewood (or walnut, depending on the model Kala send) fretboard, with 12 silver nickel frets, all easily accessible. But it’s the beautiful sound of this ukulele that truly impresses us – as we mention in the Kala KA-15S’s full review. For well-under $100, this is one entry-level model that has more than proved its worth. EleUke’s Electric Peanut is undoubtedly the wildcard of this budget list although, as you’ll discover by reading the Peanut’s full review, it fully deserves its spot in our chart. With a solid, satin-finished mahogany body cut to classic soprano size, this uke features no traditional soundhole. Instead, it’s voiced by a piezo pickup and a preamp that allows for easy headphone playing, while Bluetooth connectivity means jamming to backing tracks sent via a smartphone is a cinch. There are volume and tone controls, as well as a regular ¼” output jack, so plugging it into a guitar amp is just as easy. It also feels robust and durable, so travelling around with it – especially with the included nylon gig bag – is no problem. Like the other ukes on this list, this delightful tenor ukulele from Alvarez Guitars retails at under $100 – although it shows off a design that suggests it’s worth a lot more. The tenor body measures up at 26” in length, and is made from the classic pairing of a spruce top, with mahogany back and sides. Connected at the 14th fret is a solid, satin-finished mahogany neck, with a rosewood fretboard and 18 frets. The black ABS bidning gives it an elegant look and is matched well by the black tuning keys, while a real bone nut and saddle is another fine addition at this price. Check out the full review of the Alvarex RU26T for all the details. Finding real quality in the budget ukulele market isn’t always easy to do, but this affordable uke from Luna Guitars is one entry-level model that will appeal to all ukulelists! The Tattoo is a full-size concert ukulele, with a body made entirely from laminated mahogany, with a solid C-shaped mahogany neck. The uniqueness of the Tattoo comes from the traditional Hawaiian body ornamentation-inspired tattoo across the lower bout, which is complemented by shark teeth designs on both the soundhole rosette and fretboard. For a budget guitar, the sound on offer is fantastic – quite warm, with a rich crispness. You can really taste Hawaii! For all the details of Luna’s Tattoo Concert, check out the full review. We love a bit of a wild card at GuitarFella, and – on this brilliant budget chart – Vorson’s FSUK1BK electric ukulele is it! With a tenor size, it sports a distinctive Strat-style shape, with a glossy black finish and white pickguard. The advantage of having the double cutaway is that all 19 frets of the rosewood fretboard are easily accessible, making shredding on this uke very enjoyable. As we highlight in the full review of the Vorson FSUK1BK, this uke features two single-coil pickups, as well as volume and tone controls. After reading the summaries and reviews, it should be clear that you don’t need to spend an arm and a leg to get a ukulele that’s not a piece of junk. Those on a tight budget can still enjoy a uke with plenty of charm, style and tone. Browsing this page of low-priced beauties, you may well be a beginner. The budget market certainly appeals to those players first starting out on the ukulele – why spend more on an instrument you may not be willing to go the distance with? If you are a beginner, you will find plenty of use from the ukes featured on this page, but also be sure to check out our guide to the best beginner’s ukuleles for additional models in various price ranges that may also appeal to you. If you’re not a beginner, chances are you’re an experienced ukulelist after an affordable second/third/tenth/hundredth model to add to your collection. Or perhaps you’re looking for a cheap uke to travel with – damage or lose it on the road and it’s no big deal as, for under $100, you can probably afford to buy another one. Assuming you aren’t a complete beginner, you should know what style of ukulele suits you best, whether that’s a baritone, tenor, soprano or concert. So we won’t delve into this area. We will say that, unless you are gigging or performing regularly, electronics on ukuleles in the under $100 category are probably best avoided. Not to say they are particularly bad, but they aren’t particularly versatile and are prone to breaking. 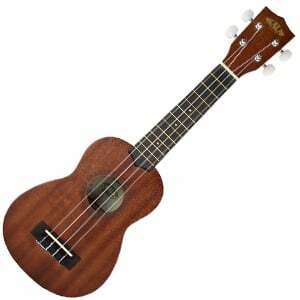 Having said that, some budget ukes, like the EleUke Electric Peanut, are very good if you are looking for electronics, but ensure you have a good use for them – if you rarely plug in, you may be able to get a better quality uke with no electronics for your cash. Another thing to look out for in a budget uke is plastic. And then avoid it! While some cheap plastic ukuleles are fun to look at, with elaborate colors and graphics, they offer little in the way of tone, and don’t feel very nice to play. In short, if you are spending $20 on a toy ukulele, you can’t expect anything in the way of quality. An exception is the popular Kala Makala Waterman, although you can still find a better wooden Kala Uke for a similar price. In general, go for a wooden-bodied ukulele, of which there are many in this range, even if they are laminates. When searching, it’s worth avoiding anything with plastic hardware, such as a plastic nut or saddle. However, as some in our chart prove, several budget models now offer bone and graphite as material of choice, so there really is no excuse to use plastic! On ukuleles in a higher price range, they tend to come out of the box ready to go, with excellent playability. Due to the more mass-produced nature of budget models, manufacturers can sometimes send them out needing a little TLC before they are at their most playable. By setting up the ukulele properly – including setting the optimal action, having a fret dress, and changing the strings – it can feel like a completely different instrument; eliminating fret buzz and generally improving playability and tone. If you aren’t comfortable setting it up yourself, take it to your local pro or guitar store, who will help (usually for a relatively small fee). We always suggest that potential buyers make a shortlist, then try out as many ukuleles on that list as possible (or at least read some reviews and check out a few videos). Having said that, around $100 isn’t a lifechanging amount for most people, so you may be less strict in your research. Stick with something from well-known brands such as Kala, Cordoba, Caramel, Luna, Alvarez, and Lanikai and you should be pretty safe. If you are ready to make a bigger investment, check out our article on the best ukuleles under $200. Enjoy your new budget uke!